After months of agonising waiting, Canon has finally revealed the Canon EOS 5D Mark III. Here are the 10 key facts you need to know about this new full-frame camera. 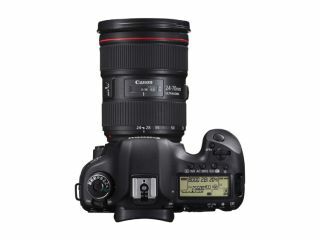 The 5D Mark III's sensor is a "mere" 22.3 million pixels, which is only just over a million more than its predecessor, and is significantly less than what is likely to be its closest competitor, the Nikon D800 which features a 36 million pixel sensor. Of course, there are several advantages to having fewer megapixels, including smaller file sizes and the potential for less noise. Though this will not please those wanting larger low sensitivity images. Cramming 61 autofocus points onto the 5D Mark III is a serious upgrade from the Mark II, which featured only 9 points (along with 6 Assist AF points). The new system has 41 cross-type AF points which should be good for accuracy, and is something we'll be keen to put to the test when we get a full-sample in for review. Another upgrade for the camera, is the 6fps shooting it offers, up from the 3.9fps that the Mark II offered. While some may be disappointed that the new camera can't offer a higher speed shooting option, at least it does boast an impressive burst depth of 18 raw images or a phenomenal 16,000+ JPEGS (when using a high speed memory card). Many people assumed that the 5D Mark III would feature dual image processors, as seen on the flagship 1DX camera. However, the 5D Mark III features only a single processor, but it is the new Digic 5+ processor which promises ultra-quick operation and is only found on a handful of current Canon models. The 5D Mark II made impressive waves with its video capability, being the first DSLR to feature full 1080p HD shooting. Naturally, the Mark III retains this feature, while also adding a few upgrades. Notably, a headphone socket now allows for better checking of sound levels. There's also a live view/movie switch on the rear, which should help with quick operation. Some will be disappointed by the fact that the 5D Mark III doesn't offer clean HDMI output, as seen on the Nikon D800, however. It seems that high sensitivity operation is a major selling point of pretty much every new camera that is released at the moment. The 5D Mark III is no different, boasting a native sensitivity range of ISO 100-25,600, which is expandable up to an incredible 102,400 in H2 mode and down to ISO 50. This is something that is likely to be welcomed by landscape photographers looking to shoot longer exposures, as well as hopefully boosting the noise performance of higher sensitivity ranges for low-light fans. Build-wise, the 5D Mark III brings a lot from both its predecessor and the lower end 7D. It has been upgraded in terms of weatherproofing, which should mean the camera can take quite a battering. The ability to edit photos and apply creative effects in camera is something that is on the increase, even on high-end cameras such as the 5D Mark III. For the first time in a Canon SLR, an HDR shooting mode has been included to combine multiple exposures, while a dedicated Creative Photo Button offers several options. Playback mode allows two images to be displayed side by side to compare images quickly and easily. In what some will see as a surprising move, Canon has so far rejected the new XQD memory card format. Currently only used on the Nikon D4, the new format boasts increased read and write speeds, but so far the card is only being produced by Sony. Perhaps Canon is saving the new format for its impending 4k camera which it announced towards the end of 2011. Instead, the 5D Mark III boasts dual slots, one for CompactFlash and the other for SD-type cards. This is likely to be a sore point for many Canon photographers who were looking forward to upgrading their camera. The 5D Mark III has a suggested retail price of £2,999. This is £600 more than its biggest rival, the Nikon D800, and leaves the 5D Mark II looking like an incredible bargain as it can currently be sought for around £1,500 - with a further price drop likely.